mmediately after the "Messias", which was created within the 24 days between august, 22. and september, 14. 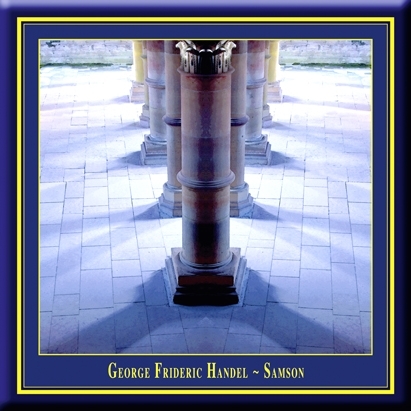 1741, Händel started to compose "Samson." At october, 29. 1741 he finished the last act, which means that those two biggest oratories, the "Messias" and "Samson," came into being within ten successive weeks only. Samson's dramaturgical fundament comes from the book "judges" of the bible. John Milton, England's most important baroque poet, has formed his epos "Samson Agonistes" by following freely the outlines of the bible. Newburgh Hamilton transformed it for Händel's oratory. It descibes the betrayal, the remorse and the victory of Samson, the israelean army commander, whose power grew with his hair, as the legend tells us. The work starts one year after the capture and blinding of Samson, when the priests of the pagan god Dagon are celebrating their greatest triumph. In his last struggle Samson, accompained by his father Manoah and his friend Micah, has to stand the temptations of the seductress Dalila and the giant Harapha, which are both followers of god Dagon and his priests. When his strenghs returns, Samson smashes the pillars of Dragon's temple and buries the enemies and himself under the rubble.